Juju-what?! Those little yellow and brown fruits in your FarmBoxes this week are called JuJubes. And no, there’s no relation to those sugary little candies you used to eat movie theatres. Although many of us in the Western world haven’t heard of this unique fruit, it has been used in ancient Chinese medicine for over 4,000 years to help calm the mind, reduce stress and anxiety, and relax the body. How do you eat Jujubes? Can you eat them raw? Yes, you can eat jujube fruit raw, in fact, they’re delicious. Small, circle or oval shaped, raw fresh jujubes are extremely rare to find locally grown! That’s why we’re so excited to get them from our local farmer friends whenever they’re available. Green when they’re immature, they become yellow-green with red-brown spots as they ripen and the fully mature fruit is entirely red. But you can enjoy eating them anytime from yellow-green to full red, however, the redder they are the sweeter they’ll be. Crisp and sweet, they have a texture reminiscent of an apple. 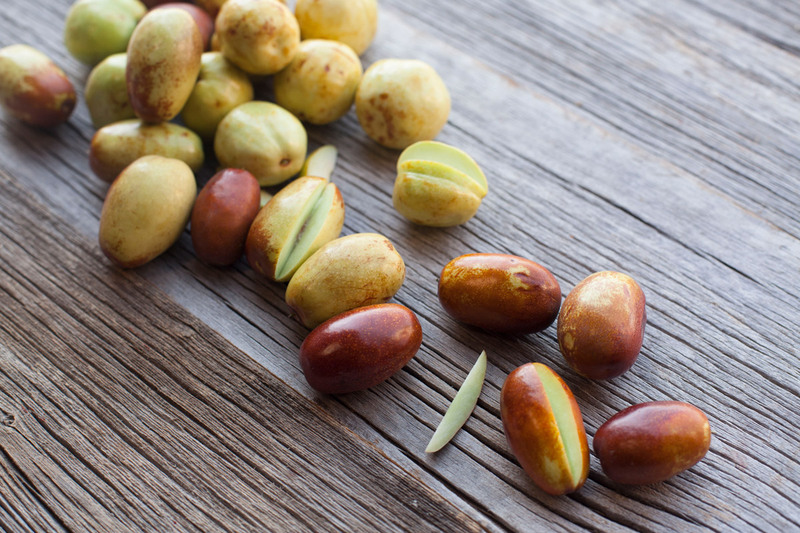 What are the benefits of Jujube fruit? According to ancient Chinese medicine and Indian Ayurveda, the jujube was used for medicinal reasons both for calming and digestion. With modern science, we’ve discovered that these ancient cultures were on to something! The flavonoids and saponins in jujube fruit both have calming properties. 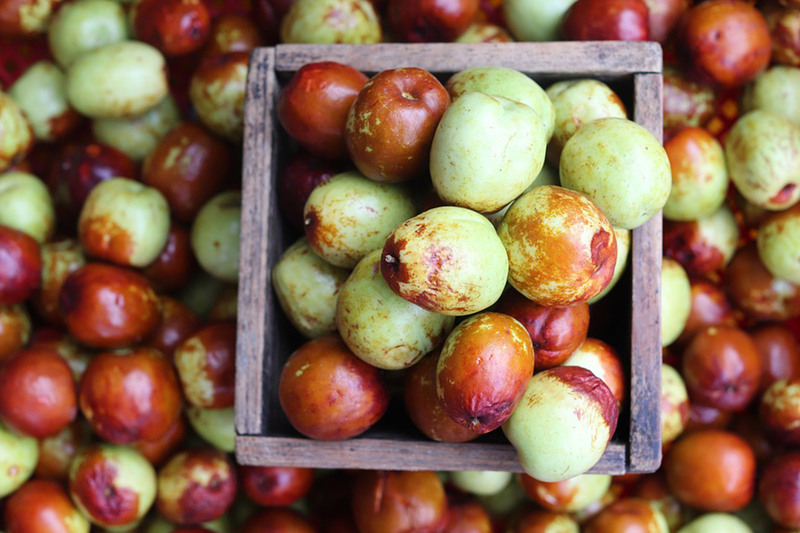 But besides calming you down, jujube fruits are super high in vitamin C, which is great for hair, skin, and nails. So not only will you get your beauty sleep, but jujubes can boost your beauty all over! 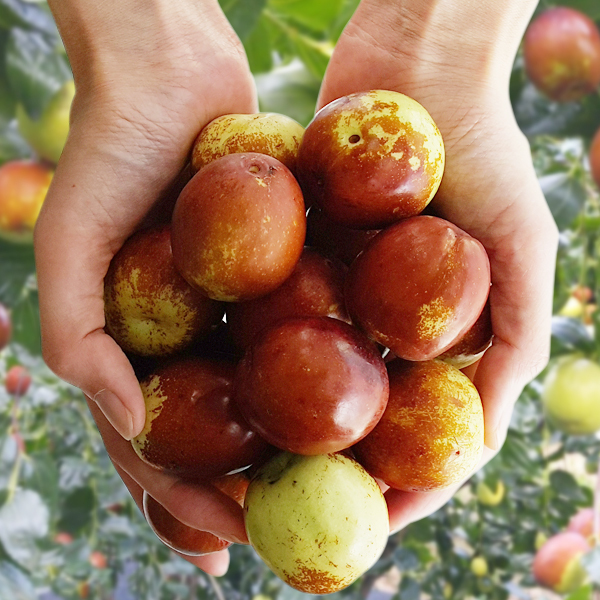 What’s the best way to eat fresh Jujube fruit? Salads: Try adding sliced jujubes to your fall salads. Toss arugula with walnuts, gorgonzola cheese, and a sweet vinaigrette. Breakfast: Slice thin and add to your morning oatmeal or on top of yogurt for added sweetness. Baked: Bake sliced jujube fruit with pork chops. Jujube Chips: Slice thinly and place in a single layer on a parchment-lined baking sheet. Bake at 250 degrees until dehydrated. Thanksgiving Stuffing: Chop and add to your favorite poultry stuffing with celery, onion, and spices.